I went back and forth on reading and reviewing this book. I try to keep my reviews free of politics, and I typically like to think of my opinions as balanced. President Donald Trump usually incites the exact opposite. Most people are either staunchly supportive of him in everything he says and does or 100% against him. There's little middle ground. Still, there is no denying that Michael Wolff's account of the President's first 100 days in office has become part of the national conversation. As a person who writes a weekly review of books, how could I not read one of the most buzzed about books of the year?! The President has brushed off Wolff's book as little more than tabloid gossip. To be fair to Mr. Trump, Wolff does little to protect himself from these accusations. Wolff starts the book by stating that the version of events he presents is his best representation of the truth based upon the varying versions he heard in interviewing White House staff. The varying renditions of events can only add to the confusion of where the truth lies. Further, Wolff never provides direct quotes or references as is the norm in other works of non-fiction. Despite all of this, the most incriminating portions of the book are directly quoted from the President's campaign speeches, tweets, and press briefings. To the approval of his supporters and horror of his detractors, Donald Trump has never been one to mince words. He says exactly what is on his mind. That being said, reading the often incoherent ramblings of the President printed in black and white can be quite alarming. These irrefutable quotes seem to support Wolff's claims that Trump is ill informed about most of the big decisions he faces. Wolff also touches upon the alleged disfunction among the White House staff. He maintains that the President's background in business makes him more focused on the "big picture". Because of this, the smaller staff positions that make the larger machine that is the US Government fucnction have not been filled. Beyond that, there is a war for the President's attention and policy that was between three sections of American Politics. Steve Bannon represents the interests of the alt-right of the Republican Party, Reince Priebus lobbies for the interest of the traditional/establishment Republicans, and Ivanka and her husband Jared Kushner vie for the more liberal interests. This collision of ideologies coupled with the President's lack of governing experience, Wolff conjectures, caused Trump to not achieve any significant legislative victories during the first part of his presidency. 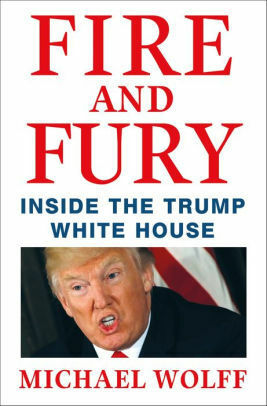 For as much media attention and hype that Fire and Fury has received, I was surprised at how little of the book was shocking or presented new information. Even the more inflammatory excerpts that made headlines are not so crazy. For example, one passage about Ivanka making fun of and describing the formation of her father's infamous hairstyle was actually a quote from years ago when she was a college student. History will ultimately be the judge of Donald Trump's time in office. Because much of Michael Wolff's more explosive claims are not verified by any specific source, I'm not sure that Fire and Fury will be remembered as part of that history. Rather, supporters of the President will likely not be swayed by Wolff's claims while detractors will use it to further fan the flames of their discontent. This entry was posted on Saturday, February 24, 2018 and is filed under Book Review,Donald Trump,Fire and Fury,Michael Wolff,Nonfiction,Politics,president. You can follow any responses to this entry through the RSS 2.0. You can leave a response. Great review. I am not surprised it offered nothing new and shocking, but have read passages myself and agree it can be shocking seeing what the President has spoken in text. For all the controversy that has surrounded the book, I was really surprised at how little controversy I gleaned from it. I wonder if I should read it or not, I feel like it probably wouldn't surprise me either. Thanks for sharing your thoughts. Like I said in the review, the book didn’t change my opinions about Trump, and I doubt it would change yours either. It is a quick read though, so definitely read it to see what all the fuss is about! I read a few pages and put it down. I thought it was awful. Not a Trump fan, but this was pure propaganda and hearsay and I couldn't take it seriously. I think it will fade away. There were definitely a lot of unverifiable claims in it. I, like you, feel the need to read this mostly because of the hype surrounding it. I am not a fan of Trump, and as soon as he tried to ban the book, I knew I had to buy it on principle! I have a feeling I’m not going to learn that much I don’t already have an opinion about. There's nothing new here, and I'm not sure how relevant this one will be even now.